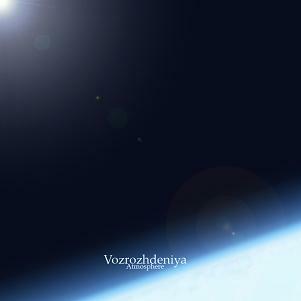 Carefully and little by little, the album “Atmosphere” by Vozrozhdeniya, starts its hour-long path through your headphones or acoustic systems, later turning into the picturesque panorama of the cover, which envelopes our native planet. You can hear typical breath-like sonic masses, which are approaching you, and then leaving you for approaching once again and etc. Such is the first track “Tropopausa”, which then gives place to “Boreas”, denoting the north wind, having the similar cooling and invigorating effect. Then come the flanging and impetuously flying revelations of “Stratosphere”; while listening to it you can get a discrepant impression, as if you are flying, or., on the contrary, something is flying by you. The fourth track “Cronos”, turns to be a complex of radionoises, unknown signals and atmospherics, swiftly shooting across the surrounding space. Ominous and powerful, the sound of the following “Thanatos” produces an impression of the atmosphere’s sternness, expressing in its gigantic volume and power of elements. “Thermosphere” is a chiefly silent piece, with suddenly emerging fragments of broadcasting and radio interferention. “Gagarin” starts with a speech of the first cosmonaut on the Earth and loud applause, transiting into a slightly rhythmic ambient piece, to some extent sad, as if mourning over the tragic fate of this great man. So, enter the “Atmosphere” of Vozrozhdeniya. This entry was posted in Uncategorized and tagged ambient, drone, self-release, Vozrozhdeniya. Bookmark the permalink. Wow – this is a very nice ambient album. The tracks are just as described and indeed Gagarin is a slightly melancholic piece, but still enjoyable.